Kentish Bus evolved from London Country South East by name change in April 1987 and set about establishing an image that had little to do with Country Buses. Kentish Bus had plans, and they were not circumscribed by the words rural or even suburban. One major change, apart from the name, was livery. Green was out, pale primrose and maroon was in. At first the parlous finances inherited by this little sliver of the London Country polo prevented the purchase of new buses. Kentish Bus won the tender for routes 51 and 51A in August 1986, and set to, working it with Atlanteans, including some of the secondhand examples from Glasgow. The need for reasonable quality secondhand double-deckers also brought the first two Olympians, bought from Midland Red North in May 1987 when just four years old. They were 77-seaters with front doorway bodies by ECW, suitable for "country" operations not requiring dual doorways. 691 and 692 were put to work from Northfleet, but in summer 1988 they were transferred to Swanley for use on the 51/A, alongside new Scanias, as part of a face-lift for the route. They did not stay with Kentish Bus very long. In spring 1990 they were fitted with coach seats and repainted in a smart Kentish Express livery of dark red and silver for use on the commuter 721 route between Northfleet and London. But in November 1990 they went north to Northumbria, just as a larger batch of secondhand Olympians came the other way. January 1988 saw Boro'Line Maidstone enter the LRT tendering scene, having won the 228/328 pair of routes (Chislehurst- Eltham - Sidcup circular, both ways) and the 233 instead of London Buses' new low-cost unit: Bexleybus. Boro'line used the Bexley Council depot at Crayford initially. A batch of fourteen Olympians with ECW bodywork was ordered, but were not ready in time. Service started with a number of older buses loaned by Leyland Motors: ex-Hull and Greater Manchester Atlanteans, but the order for Olympians - now reduced to eleven - began to arrive in February and were all there by March. Bodies were 76-seater front entrance full-height Optares, to the ECW design. Livery was Boro'line's striking blue and yellow with silver-grey skirt and red flash-line. A twelfth Olympian to the same specification arrived in June 1989. E152OMD has been preserved by the Bromley Bus Preservation Group, and appeared in original livery at the East Grinstead Running Day in April 2012. 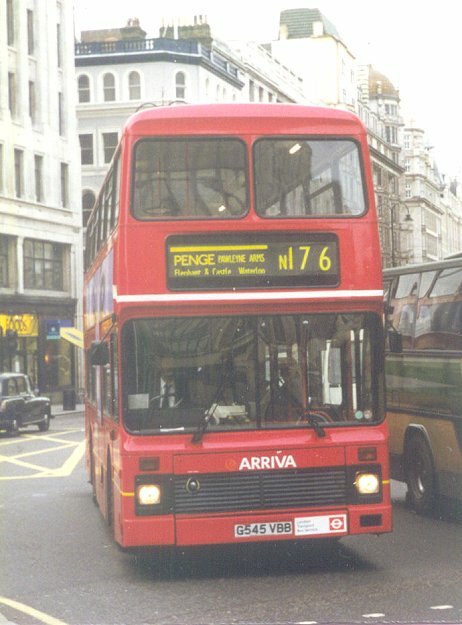 In February 1992 Kentish Bus took over Boro'line's London contracts and associated fleet, so the twelve ECWs came to Kentish Bus, and donned the more sobre primrose and maroon livery. They lasted well with Kentish Bus, some receiving the later green and deep yellow Kentish Bus livery, and became part of the Arriva empire with Arriva Kent Thameside. 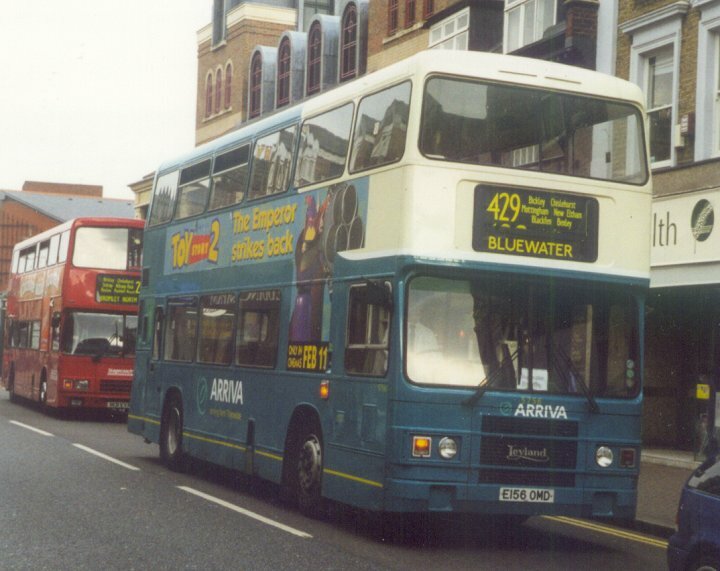 Some moved on in 1999, moving back deeper into Kent with Arriva Kent & Sussex. 5756 was one of the long-term survivors with Arriva Kent Thameside. In March 2000 it was very busy on the 429 between Bromley and the new shopping pit at Bluewater. The upgrade on the 51 and 51A had to be completed for the re-award of the tender in 1989. Thirteen new Leyland Olympians with Northern Counties bodies arrived in September, and were allocated to Dartford, new home for the route after Swanley had closed (again). The new buses were single doorway 77-seaters in primrose and maroon. They were very similar to the Olympians that had been bought for Bexleybus, but with a new front grille treatment that was to continue for some time, and which reflected the new aggression in the market-place better than the Dominator-style small grille used before. There was a narrow window behind the doorway too, presumably to help with sighting on oblique junctions. The heavy upstairs pillar remained. They stayed with Kentish Bus and the 51/A for the duration of the contract with LRT, apart from brief loans to Leyton when their new buses were late. But in September 1992, with the expiry of the contract they were all withdrawn and redistributed. Four (501-4) went immediately to London and Country as their LR501-4, and received their green, green and red livery. Later on, in 2000, they moved, still within the Arriva empire, to Arriva Midlands North. The others were bought by the Drawlane Group and went to Bee Line Buzz Co and Midland Fox, later circulating to Arriva Midland North, Stevenson's and Arriva North West. Kentish Bus was doing something right at this time. They won a batch of contracts for LRT that took them into the heart of Central London, and north of the river too. The "..ish" was more than the "Kent.." for these jobs! A new operating base was found in Leyton, ready for a start in January 1990. The routes involved were the 22A, 22B, and 55, won from the London Forest district of London Buses. 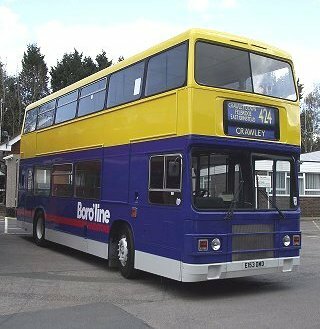 Kentish Bus ordered 43 Leyland Olympians with Northern Counties dual-doorway bodies. These were very similar to the single-doorway vehicles, except for the extra door of course. The windows were moved forward slightly, eliminating the upper-deck thick pillar, stretching the rear upper window and moving the short lower deck window to the rear. On the offside the staircase was in the second bay. They arrived in January for the start of the 22A, and in February and March for the 22B and 55 takeover. (Some single-doorway buses were loaned briefly). The 42, operated by Kentish Bus from Southwark with Leyland Nationals, was also taken over on Sundays by the new double-deckers. The contract for the 22/22A was reawarded in 1993 and in May 1994 Kentish Bus moved the routes' buses from the temporary depot at Leyton into the mothballed LRT garage at Ash Grove, which it called Cambridge Heath. 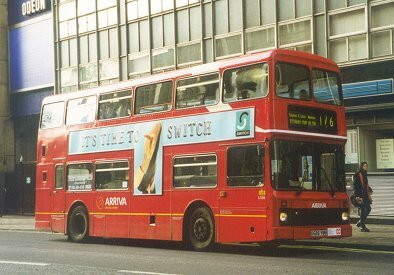 At the end of 1997 Arriva announced its plans for a thorough rationalisation of its London companies, which saw the end of inner-London operation by Kentishbus and Londonlinks. Operation at Cambridge Heath lasted until February 1998, when operation of the 242 (successor to the 22A and 22B), passed to Arriva London North at Clapton. The 55 went to Stagecoach East London. The Leyland Olympians went to Leaside at Clapton, then most went south to Norwood - part of Arriva London South. There they initially replaced the East Lancs bodied Volvo Citybuses on the 176 and 188. Red Arriva livery, with logos, strap-lines and L-prefixes to the fleet-numbers followed. L545 was in Aldwych earlyish on Saturday 5th December 1998, on the 176 (but with a N176 blind), while L526 made its way up Charing Cross Road later in the day. Some of the Leylands moved to Tottenham in 1999 for the 243 and Sunday 73. Displacement from central duties by the tide of low-floor DLAs followed in 2001-2, and some moved out to the old Grey-Green garage at Barking. There they displaced very similar, but single-door, Leyland Olympians that originated with County Bus, working on the 103 to Rainham. 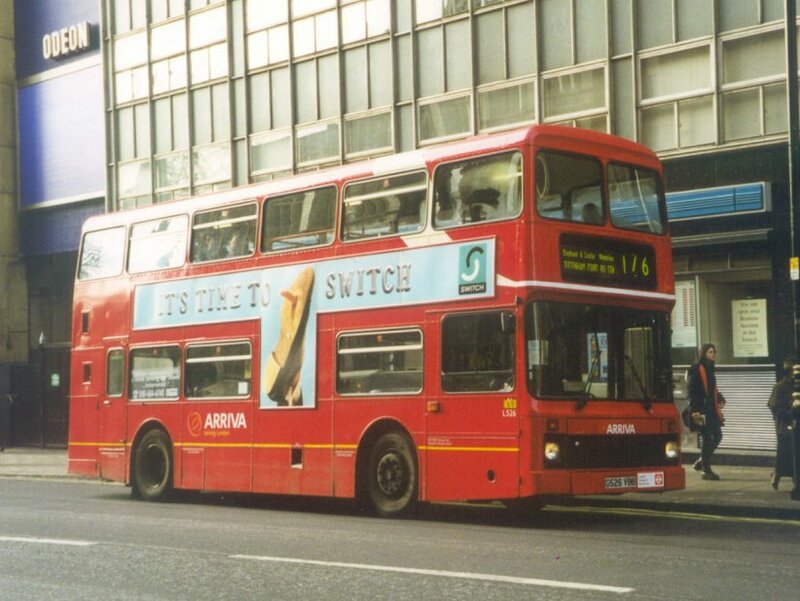 During 1990 Kentish Bus did a vehicle exchange with Northumbria Buses. Leyland Nationals and the long coach LRC Olympians moved north, as did 691 and 692, while 21 ECW-bodied Olympians came south, filling the 3** number series vacated by the LRCs. 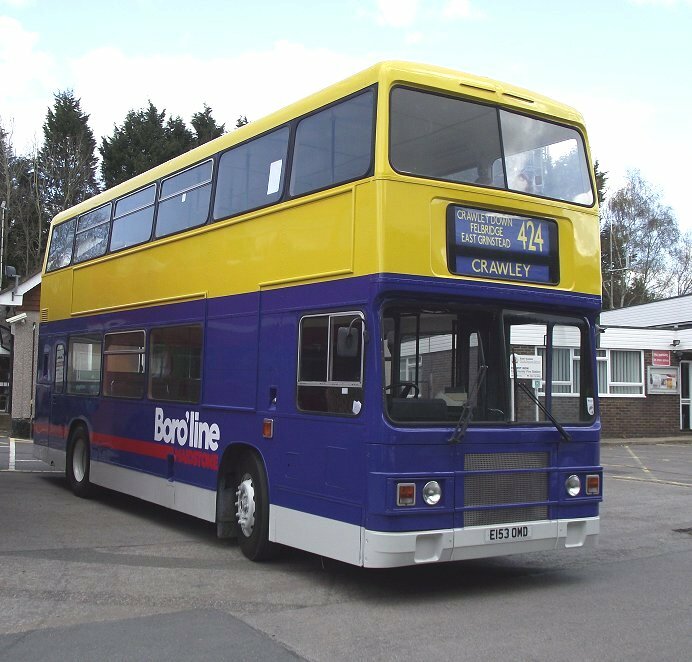 This batch varied in build date from early 1983 to late 1985, and were single-doorway 77-seaters. They were divided between Northfleet (9), Dartford (9) and Dunton Green (3), and received Kentish Bus primrose and maroon livery. They came into their own in early 1991 when the long 96 route (the old 696 trolleybus route) from Woolwich to Dartford, came to Kentish Bus by LRT tender, possibly because these were relatively cheap buses in terms of book value. Their fleetnumbers were increased by 300 to 601-621 in February 1995. Some went in December 1995 to Arriva Cymru (with more in 1999). Arriva Durham County took most of the rest in spring 1998 while one (618) went to neighbour Metrobus in August 1998. In January 1991 Boro'Line Maidstone took over the 132 from Bexleybus. For this they bought six new single-doorway 77-seater Northern Counties-bodied Leyland Olympians. Perhaps Boro'Line fell into the expansion trap experienced by so many companies in the bus tendering game, especially when they have bought or leased new buses. By the end of 1991 their finances were in a difficult position, and ProudMutual, owners of Kentish Bus, considered buying them outright. When they saw the figures, they bought just the London operations. So in February 1992 these six buses joined Kentish Bus, as well as the earlier batch of Optares plus some Lynxes and a pair of Scanias. (The Medway operations went to Maidstone & District). The six Olympians continued with Kentish Bus into Arriva ownership, where they acquired turquoise and cream "scoop" livery. 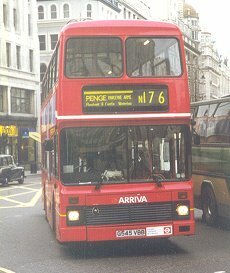 In January 1999 they were transferred away to Arriva Kent & Sussex.